There's pretty much no season that we wouldn't like to experience at Hogwarts...but Fall would be our favorite! The Start of Term feast, the changing leaves, the smell of fresh parchment, All Hallows Evening, crisp breezes during trips to Hogsmeade—we can hardly contain our excitement imagining it! 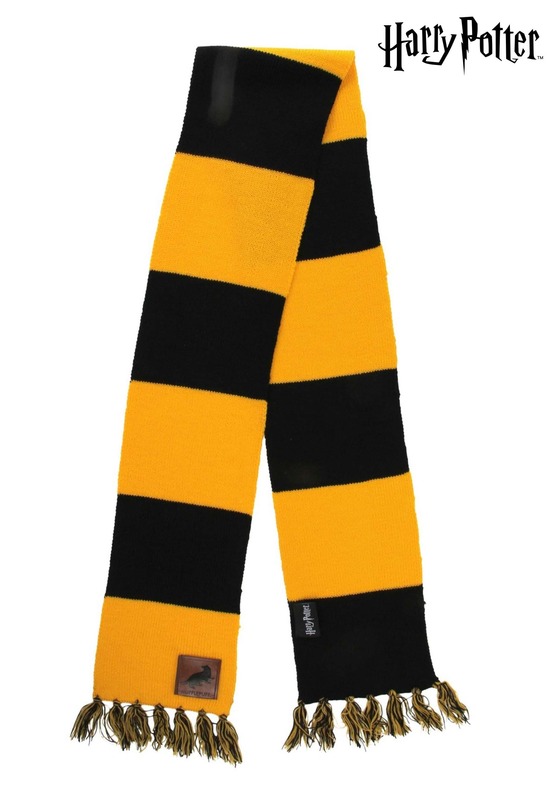 We're guessing you feel the same way, which is why you've found your way to this Hufflepuff House Patch Striped Scarf! If you can't wait to be a badger, wrap this warm accessory around your neck and enjoy a night trick-or-treating in your house robes. Maybe your Hogwarts letter just got lost in the post—those owls are known to be a bit flighty! An officially-licensed scarf, such as this one, is just the thing to top off your Hufflepuff costume and keep you cozy for a night of Halloween magic! This scarf is knit in alternating wide stripes of yellow and black—the Hufflepuff house colors—and features a little leather badger patch, as well as tag on one side that says "Harry Potter." Tassels on the ends keep this scarf feeling perfectly collegiate and autumn-ready—perfect for a day as a Quidditch spectator or a stroll along the campus grounds. Remember that Halloween is about dressing up to your heart's content, so don't let anyone tell you that Gryffindors are better. It takes a special kind of witch or wizard to wear the yellow and black—wrap this scarf around your neck with pride (and maybe practice a few disarming spells, while you're at it...just in case).